Get started with your 30 day free trial by adding a payment method. You can easily cancel at any time. We have a 60 day no hassle money back guarantee. If you don't find that Tiller is helping you better understand your finances within two months of your trial ending reach out to us and we'll give you a full refund. Enter your payment details in the "Subscription" area on the Tiller Console, accept the terms of service, and then click "Subscribe." 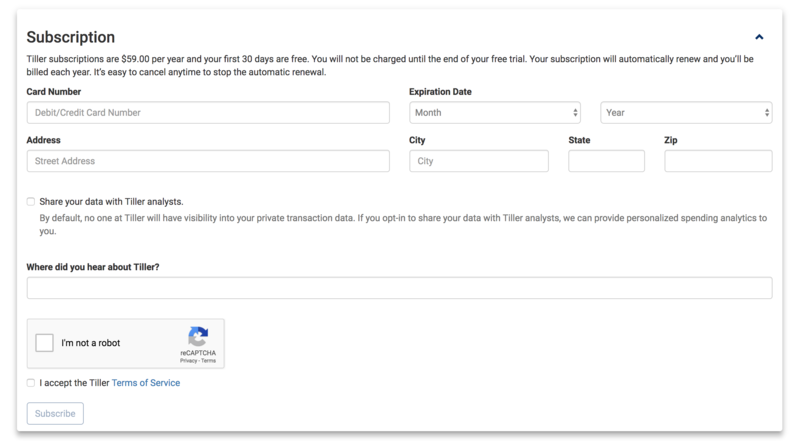 After you add a payment method and begin your free trial you will be able to create your first Tiller Sheet. How do I know if my accounts are supported? If you're concerned that your accounts aren't supported and want to confirm before you start your free trial reach out to us using the chat window in the lower right corner of the Tiller Console with the name of your bank and the URL you use to log in.